PLAGE DES CULS NUS - Hossegor, Landes, Nouvelle-Aquitaine, France - The Quiksilver and Roxy Pro France, Stop No. 9 on the World Surf League (WSL) Championship Tour (CT), has been called OFF for the day due to small and inconsistent surf on offer. Event organizers will reconvene tomorrow morning at 8:30 a.m. CEST to reassess the conditions and make the next call. "We are actually off for the day," said Kieren Perrow, WSL Commissioner. "We have small two-foot surf on offer, so we are going to wait for better opportunities. We are going to come back tomorrow morning and make an official call at 8:30 a.m. local time and see whether we will get heats underway." Decreasing and small to very small surf is expected Thursday into Friday. A slight bump in surf is likely late Friday and Saturday. At least slightly larger surf is possible Sunday and into Monday with variable onshore flow possible. The last few days of the event window look promising for stronger swell and generally favorable local wind/weather. In addition to the exciting action coming up during this year's event, today the World Surf League (WSL) has announced a three-year renewal of the partnership with Quiksilver and ROXY as Title Partner of Stop No. 9 on the WSL Championship Tour (CT). 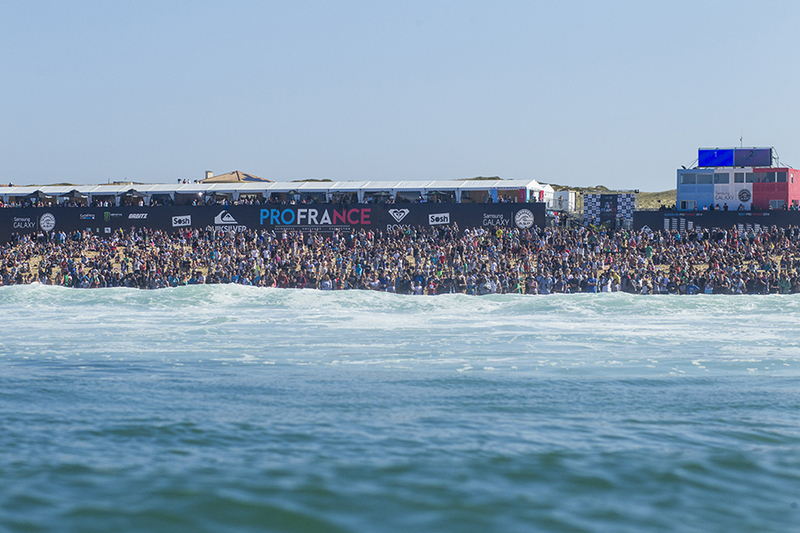 The deal will see the legendary beachbreaks of the Landes region host the Quiksilver and ROXY Pro France for the next three years, through 2021. 2018 marks the 17th consecutive year that the brand has supported the event, which sees the iconic surf towns of Seignosse, Hossegor and Capbreton welcome the world’s best surfers for the sole French stop on the tour. Held from the 3rd to the 14th of October, 2018 the Quiksilver and ROXY Pro France will see 18 female and 36 male elite athletes vie for the coveted event titles. The event also plays a key role in deciding the WSL Men’s and Women’s World Champion each season. This year ROXY-sponsored athlete Stephanie Gilmore (AUS) has the chance to clinch a record seventh world title, while the event will prove to be crucial in setting the stage for the men’s title race. “Quiksilver and ROXY are very excited to continue our long-standing support of this very special event and of the WSL as we showcase the full range of amazing athletes, especially the athletes we are lucky enough to sponsor under our banner”, said Quiksilver Global General Manager Garry Wall. “Securing this long-term partnership this week is especially meaningful as we kick off this year’s event in memory of our former leader and industry visionary, Pierre Agnes, whose passion for this event and region was unparalleled”, said ROXY Global General Manager Emilie Souvras. The brand’s commitment to hosting the event surfing in October, outside the peak season, during the prime time for the best conditions has generated a positive effect on the local economy by extending the tourist season through the event window. Tens of thousands of spectators flock to the beaches during the event for the chance to see the high-performance showdown from the world’s surfing elite. The holding period for Quiksilver and ROXY Pro France opened on Wednesday, October 3 and will run through Sunday, October 14, 2018. The event is broadcast LIVE on WorldSurfLeague.com and the WSL’s Facebook page. Also, check local listings for coverage from the WSL's broadcast partners. As always, local fans will be able to follow the event LIVE on a big screen on the Central place in Hossegor, and enjoy movie screenings and music acts in various places during the event’s waiting period. Quiksilver and ROXY host an onsite merchandising area where they sell event branded apparel, beachwear, headwear, and footwear.